Indian Trade Goods: The prices charged for Indian trade goods were often criticized as being exorbitant. But the long and dangerous voyage via Hudson Strait and Hudson Bay, where many vessels were wrecked, and the toilsome journey up the inland rivers, or the equally difficult Ottawa route from Montreal, with over a score of portages, entailed an enormous expense. 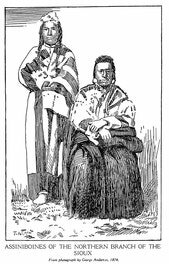 The Indians, however, considered such commodities as steel tools and weapons, clothing, etc., as well worth what they paid for them in furs. A steel knife or hatchet was greatly superior to their primitive stone or bone implements: fire-arms were more efficient than the bows and arrows slowly fashioned by themselves. 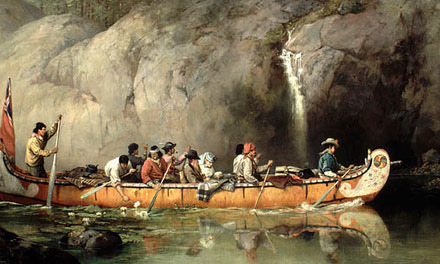 The Hudson's Bay Company prudently refrained from providing them with quick-firing rifles, and sold them only flint-lock or percussion muskets, in order to conserve the supply of game on which they depended for their existence. But free traders, anxious only for quick profits, had no such scruples, and traded repeating rifles, with the result that some districts were deprived of fur-bearing animals and the Indians reduced to destitution. It was usually about three years before the European trader got any return for his investment: the first year for the dangerous transportation of the goods, a season for the trading and the packing of the furs, and another year for the risky journey to England, and the varying chances of profit according to the state of the market when they got there. Indians soon began to realize that furs were greatly prized by Europeans. They became more exacting in their demands and more discriminating in their selection of trade goods. Beads became important articles of trade during the seventeenth and eighteenth centuries. Most of them were made in Italy, at Murano, on the outskirts of Venice. They were of many varieties, to suit the preferences of various tribes; for instance, the Indians of the north-west Coast considered blue beads most valuable, while southern Indians white. Birmingham and Sheffield were centres for the manufacture of cutlery, mongery, brass ware, buttons and guns. Trade muskets before 1767 were often made of shoddy materials. Flints were made at the Brandon quarries, eighty miles from London. For export they were packed in half casks containing 2,000 musket, 3,000 carbine or 4,000 pistol flints, and weighing from sixty-five to seventy pounds. Buttons were of brass or pewter. Brass kettles were of various sizes, packed in "nests." 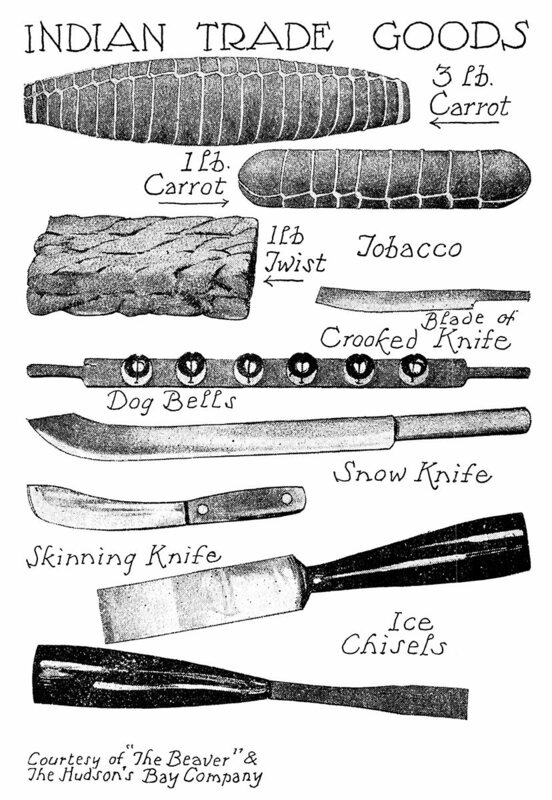 All steel ware, as axes, hatchets and knives, had to he tempered to the right degree to meet the rigoures of the winters of Canada. The Indians were always begging for blacksmiths to settle among them to repair their kettles, axes, hoes and guns. Among the goods most in demand were beads, blankets, broadcloth, flannel, gartering, gloves, laced hats, handkerchiefs, duffle, needles and thread, twine, worsted and cotton.